I love pina coladas. Those are my all-time favorite tropical cocktails. I started out drinking virgin ones as a kid and learned how to make the real deal as an adult. Well, as I'm sure you know, pina coladas are loaded with calories (and rum! ), so if you're worried about your waistline (hello! I just had a baby 5 months ago and I still have that stubborn last 5 pounds to lose!) and if you want to skip the alcohol (Hello again! Breastfeeding here! ), then I have the answer for you (and me!). The secret is R.W. 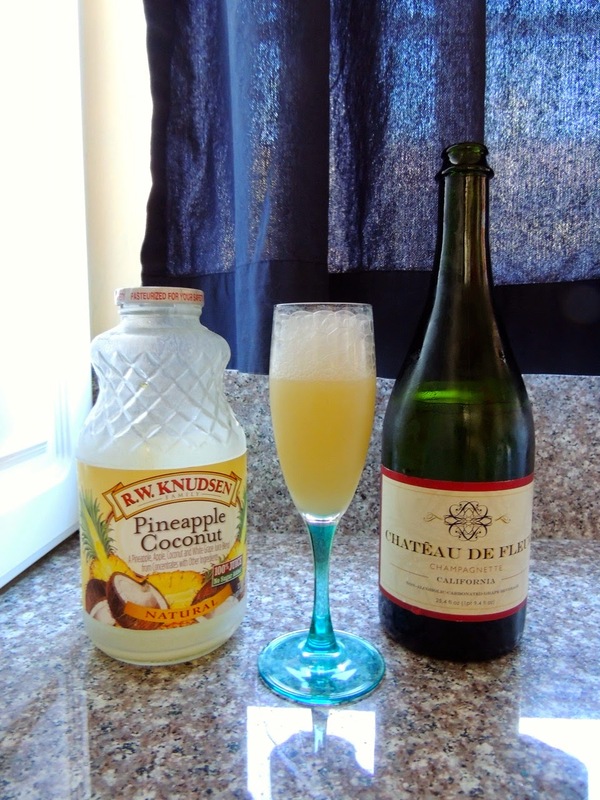 Knudsen Pineapple Coconut juice, but the trick to a bubbly alcoholesque taste is Chateau de Fleur...it's non-alcoholic California champagne, people! If you didn't know, you totally wouldn't know that it's non-alcoholic. Enjoy! Pour the juice in your favorite cocktail glass and top with Chateau de Fleur. Cheers! Calorie count? 58 in 4 oz. Oh, yeah! If you like this mocktail, you should also try my Skinny Pregnant Girl Mimosa recipe.